As you probably know, bookmarks don’t always have to be made of paper. It can be made out of many things: wood, metal, plastic, ceramic, fabric, leather, resin and other materials I have no idea you could make bookmarks out of. And as varied as the materials are, bookmarks also come in different shapes and designs. 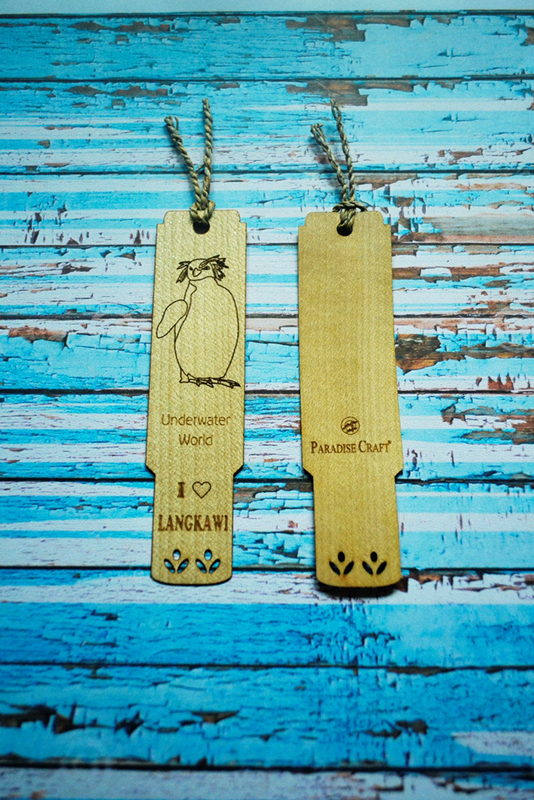 So today, as we open our birthday month, I chose to feature wooden kinds of bookmark from all over the world. Wood is a good material for a bookmark as long as it’s thin and smooth so as not to ruin the pages. Different manufacturers use different kinds of wood for bookmarks. Some of these companies claim to be using only sustainable wood, meaning their wood comes from ‘sustainably’ managed forests. Before I show you some of my wooden bookmarks, let me establish that bookmarks don’t only help us locate the last page we read, but is also a source of knowledge itself. Bookmarks carry all sorts of information. Some feature stores, events, tourist attractions, people, campaigns/advocacy and products besides books. And I don’t necessarily mean only through written words but it could simply be a picture or a representation of something else. You get the idea. If you’re curious enough, you’d be surprised to see how many interesting things you can learn from bookmarks. This is how I came to learn about the Hill Tribes. Maybe you knew about them from school or from your travels. (Lucky you!) I only knew of them when I got some from a Thai exchange partner. 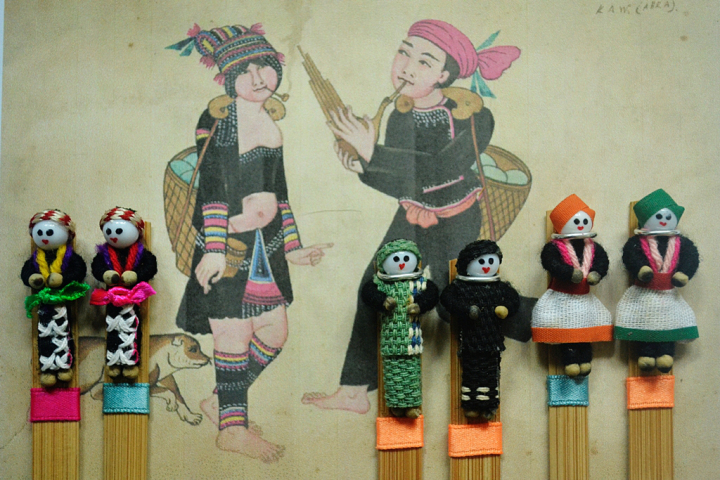 I was given a set of Hill Tribe inspired tiny dolls showing their colorful costumes. These next ones I found in Kuala Lumpur and Kota Kinabalu, Malaysia. The Kebaya is made by ARCH Collection. ARCH products are mostly made from wood veneer and are hand-assembled. A former colleague of mine went to Langkawi, Malaysia and got these for me as pasalubong. It’s made by Paradise Craft, also a maker of wooden handicrafts. While strolling in a night market in Beijing scouting for bargains, I stumbled upon this unusual find. Who would expect to see a bookmark set in a flea night market? When I bought it (jumping up and down and wanting to scream inside), I didn’t have any idea what the characters said. I didn’t care. All I cared about was that it was an interesting set of bookmarks. That is, until a friend of mine decoded the Chinese characters for me. And this lovely set has never been more special to me. We call this the Chinese Calendar Girls, with each month representing a flower. And finally, wooden bookmarks from the sunny Philippines! Most of them I got from souvenir shops in Davao and SM Kultura. As observed, the common features of our own wooden bookmarks are the T’nalak inspired designs and the tiny brass bells. Which make the entire look so sophisticated and intricate. Don’t they look so fashionable? If you’re feeling crafty and want to make your own wooden bookmark, you should remember to make it as thin—but not to the point of breaking—and as smooth as possible. If you’re painting it, make sure the paint won’t stick to paper and of course, that it’s free of toxic substances. And remember, if you’re planning on producing many pieces, remember to buy only sustainable wood. I have a similar wooden bookmark from Thailand! But mine has an elephant head at the top. 🙂 But I always get scared that it might break so I seldom use it.